Here’s Day 9 of the Saint Therese of Lisieux Novena! I have been praying for another child after the current one is 10yrs now, i still have hope that one day a miracle will happen in my life. I have countless testimonies of miracles due to constant trust in praying novenas! I ask for your intercession for me in this one that God’s will be done as I patiently wait. Thank you St. Anne for your intercession, and make me a strong woman of faith that my husband too should have faith in the name of the Father, Son and Holy Spirit, Amen. 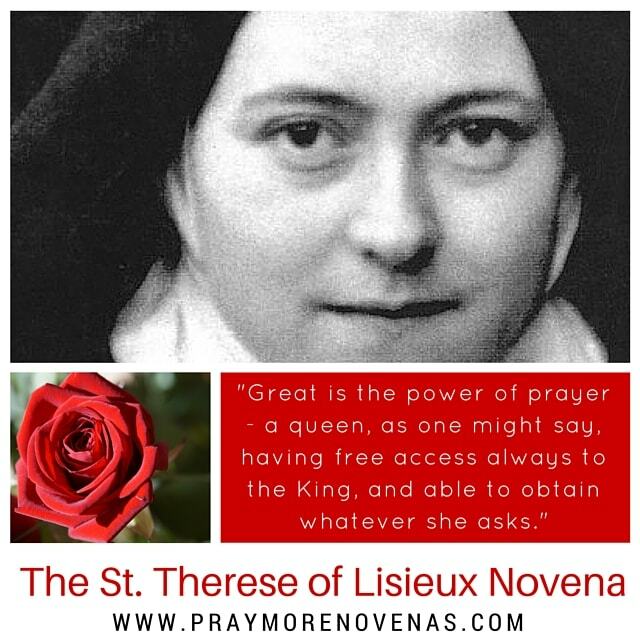 While I was praying this Novena, I had a dream that I was given two flowers in a row, and I have come to believe that my prayers have been answered, I thank st.Therese because I have believed in the intercession that has been done for me, I am waiting for my miracle, and I want to thank everyone who prayed this novena, keep the Faith, everything is possible with God. Thank you st. Therese for your intercession. St Therese Little Flower thank you for listening and praying for me and my family. My intentions have been answered through your novena. My son his family and my daughter her daughter joined me at church on Sunday. Thank you please keep them in your prays and pray for all my family to know that they need to be close to God and speak to Him in pray and attend church regularly. God Bless! hopefully together with my wife & daughter and receive the sacraments daily and to visit our dearest Lord in the Most Blessed Sacrament daily & do more deeds of mercy & love. Eternal thanks to all & MAY GOD BLESS US ALL ALWAYS & GRANT OUR PRAYERS THAT ARE FOR THE GOOD OF OUR SOULS & OTHERS! I have a promising job interview. I pray That if it is God’s will that I get the job and that the company is fair and good. Please pray for me that I make the right decision. Most blessed St. Therese, please pray for me and my husband F.C., and our financial situation. Praying for guidance in our Spirituality and a deeper awareness of what’s God’s plan for us. Please pray for my sister, MD and JD for a better relationship in her marriage with her partner in Jesus Holy name.???? Please pray for the people of Puerto Rico, Florida, Texas, and all other victims of Harvey, Irma, and Maria. Amen. Dearest Saint Therese of Lisieux, please pray that the wound in my knee will be healed, and that the lump on my hand and neck will completely disappear. Please pray for my daughter, GM, to pass the entrance exam for high school, and for my son, MM, to pass the medicine exam, both in October. I pray for restoration of peace in my family and for our businesses to succeed and prosper. Please pray that we are sent more clients by our Lord, and for our financial challenges to be met with ease. Thank you and in Jesus’ Name we pray, Amen. The Message I’m receiving today, Is to Love those who are hardest to love! Help me St. Therese, to do on earth as in heaven! Help me to Trust You more Lord, Help me to Love You more Lord… Help me to Look To You to do the Good on earth and spread the goodness You have offered up to me…I’m Grateful for all Your blessings in my life! I’m am humbled in all I have been given. Help me to increase Your love with mine for the goodness of all my family, especially that of my 3 sons! Thank you God for all of our blessings! Lord jesus I place my financial needs into your hands. I pray today for financial deliverance. I pray for those persons that wish harm for me I pray that I will have forgiveness in my heart for them. loath always . Open my eyes to what is good in Faith , Love and Selflessness Amen . Local Time : 10.40 p.m.
With your help I want to do Gods will! I want to serve God! Thank you for listening! I feel blessed to have God and the Saints in my life! Please pray for my marriage St. Therese. My husband wants a divorce and I don’t. I love him and my family. We have twin 5 year olds who love us dearly. Please intercede on our behalf, bring calm to our lives and restoration. Please pray for my husband’s salvation in Christ, that he accepts Jesus Christ as his Lord and Savior today.